Date of birth on 28th May of 2017. "It's an angel with wings!" said our guest, looking at Cicco. He has a wings pattern on his shoulder blades, a golden character, he is calm and easy. 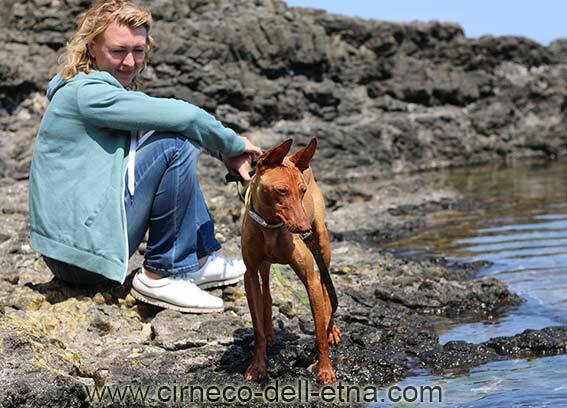 Do you know the character of a typical cirneco? They are jealous, somewhat independent, proud, stubborn and cunning. HE IS NOTHING LIKE THIS. I always introduce him to our visitors as the exeption to the rule! And... he adores to play with water! Is it possible for a Cirneco? :-) Watch the video! He listens to me, puppyish, with his head tilted to one side. Enchanted by words, commands and praise. And very afraid to disappoint his owner. Cicco is the coziest of all my dogs. Small, sturdy, compact. Snuggles on the couch by my side during I read a book, invisible and insubstantial, like a little house-elf. His coat is silky, rich and very soft. Pleasant to touch, gentle as he is, a real anti-stress pet. Cicco was born out of beautiful Era and Ottoman, both dogs were bred by me, I like him in all ! I hope his puppies will inherit his briljant character.